As part of its 40th season the Blyth Festival is presenting the world premiere of Stag and Doe by Mark Crawford. Crawford was last at Blyth in 2011 in its production of Vern Theissen’s World War I play Vimy. Crawford wrote the play during his stay in Blyth inspired by his own brother’s stag and doe in 2004 in Glencoe, Ontario. Crawford who grew up in Glencoe, has said, “Spending a summer in smalltown, rural Ontario,... I thought I would love to tell a story to these people, for them, about them”. That’s exactly what he has done in Stag and Doe and what makes it such a delightful play. It is a comedy that does not rely on an outrageous plot, on shock effect humour, on a dialogue of one-liners or set-ups and punchlines. Instead, the plot, humour and dialogue are so amusing because they are so true to life. For those, like yours truly, who did not grow up in Southern Ontario and did not know what stag and doe was, the show was an educational introduction to local culture. A stag and doe is not, as I had mistakenly assumed, some kind of combined bachelor and bachelorette party. Instead, a stag and doe, sometimes called a “buck and doe” or a “jack and jill”, is a party held by an engaged couple to raise funds for their wedding. Those invited have to buy tickets to attend, there is a cash bar, a raffle and party games – all with the intent of making a profit. It is a way for the community to have fun and help the engaged couple begin their new life without debts incurred by their wedding. 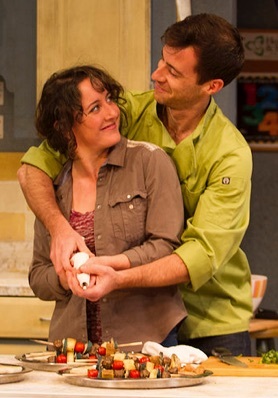 Crawford’s ply is set entirely in the kitchen of the community centre where Bonnie (Elizabeth Kalles) and Brad (Eli Ham) are having their stag and doe that evening. Bonnie and her maid-of-honour Dee (Rebecca Auerbach) are discovered in the midst of making Jell-O shooters, which apparently are de rigeur at such events. They are waiting for Brad to arrive with the booze. He does arrive, but without it, because he doesn’t have enough room on his credit card to pay for it. He wants to borrow Bonnie’s, but she too is out of room on her card and has to confess the reason. After weeks of searching in stores and online, Bonnie finally found and bought “the perfect wedding dress”. The problem is that it cost four times what she and Brad had budgeted. The two will now be lucky if the stag and doe covers the cost of the dress let alone the wedding and reception. The next problem arrives in the form of Mandy (Nicole Joy-Fraser). Her wedding is to take place that day and the reception is to be held in a marquee at the home of her wealthy parents. It so happened that a violent storm that had passed through the area carried off the marquee and laid waste to the tables, chairs and decorations. Pushy and self-centred, Mandy demands that Bonnie and Brad hold their party elsewhere so she and her husband-to-be Rob (Jason Chesworth) can hold their reception in the community hall. Since there are no other venues available at this late date and since neither Mandy nor Bonnie will budge, Dee, used to being a peacemaker, suggests that Mandy have her reception until 9pm whereupon Brad and Bonnie can use the hall for their stag and doe. Dee is extraordinarily kind-hearted to suggest this since Rob jilted her at the alter seven years earlier. Things have apparently been settled when the caterer Jay (Greg Gale) arrives without his sous-chef or wait staff. It turns out that they have been arrested for street racing and their vehicles impounded (inducing Mandy and Rob’s wedding cake). Desperately in need of help, Jay presses Brad, Bonnie and Dee into service as his staff. Brad and Bonnie are not too happy about this until they find they will be paid, while Dee is rather pleased since she has taken a shine to the good-looking and single Jay and he to her. The fact that the central couple Brad and Bonnie is so ordinary is both a flaw and a virtue. The virtue is that Crawford has not tried to create an artificially quirky couple as so many playwright do but rather a likeable pair that you could easily imagine living on your street. The flaw is that this general likeability doesn’t give the actors much to work with. Fortunately, neither Elizabeth Kalles nor Eli Ham do anything to make the two funnier. In keeping with the realism of the show they make them smart, easy to anger but just as easy to forgive and blessed with enough insight to learn from what is going wrong with Rob and Mandy’s wedding. The two cause the tension that arises from Bonnie’s purchase of the dress to tighten and relax just as it would in the relationship of two basically sensible people. Rob and Mandy provide the principle contrast to Brad and Bonnie. Brad is a cad who easily justifies his mistakes, such as jilting Dee, to suit his high opinion of himself. He is, however, more reasonable than Mandy, and Jason Chesworth perfectly gradates Rob’s increasing anger at his bride throughout he show. Nicole Joy-Fraser is very funny as a spoiled brat so used to getting everything she wants she can’t cope with the compromises she has to make for her wedding reception except by getting drunk. Just as Rob’s anger rises so does Mandy’s increasing drunkenness which becomes one of the constant sources of humour in the play. having been jilted at the altar has caused Dee to suffer but also to have a less romantic, more practical view of the world than Bonnie. Auerbach well conveys both hurt and longing in Dee’s background as well as the clarity of vision they have given her. Greg Gale is warmly engaging as the caterer whose day is going just as wrong as Mandy’s wedding. Gale’s subtle body language tells us that he is both shy and interested in letting Dee know he likes her long before he says anything to her. Balancing the hysterics of Rob and Mandy’s reception-gone-awry is the subtler interaction of Ray and Dee and tension Crawford creates in making us wonder when they will finally say outright what they are feeling. Stag and Doe is a lovely, well-written comedy based on keen observational humour. It captures the nature of small town society in both the fierce rivalries it can generate but also in the sense of community. Pat Flood’s extraordinarily detailed set of the community hall kitchen is amusing in just the way the play itself is for the accuracy of its details of Southern Ontarian life. Yet, as in the best plays, the specificity of the setting allows Crawford’s play to explore the universal theme, here the general human problem of people losing sight of the forest for the trees. Stag and Doe received a genuinely enthusiastic reception. Its down-to-earth humour and lack of artifice are sure to make the play popular throughout Ontario and, I hope, beyond. This is only Mark Crawford’s first play. Let’s hope there will be many more. Photos: (from top) Nicole Joy-Fraser and Jason Chesworth; Rebecca Auerbach and Greg Gale. ©2014 Terry Manzo.